OK - I have one of those. 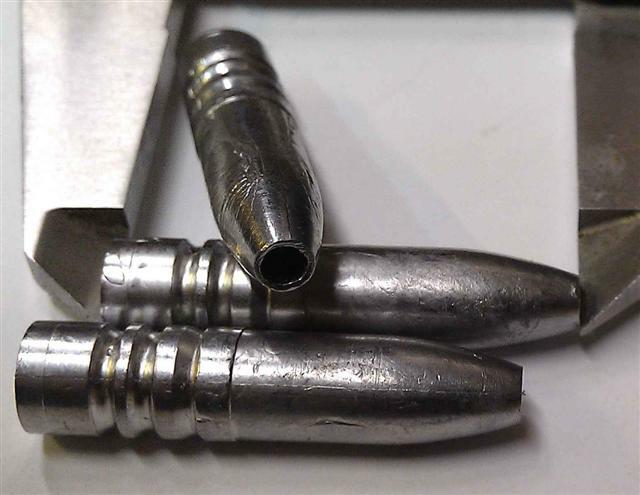 Here is a great projectile to add to the .30 "perfect" caliber. 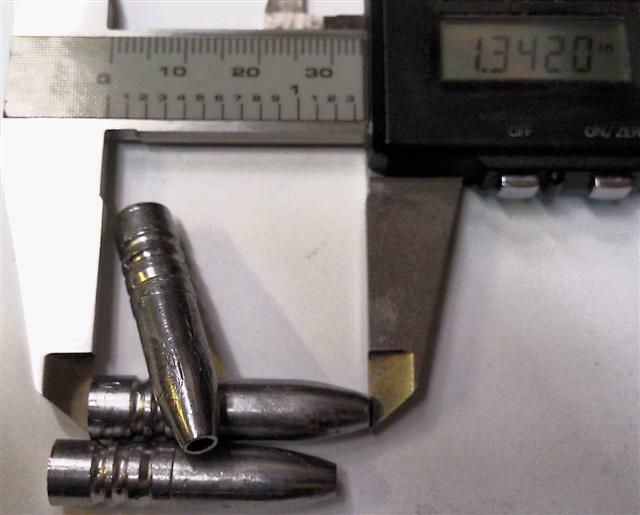 A .308 Hollow Point 247grains lead projectile 1.342 inch long. You would need FAST twist to get it flying right, mine is 1 in 8.
so all result are fully wrinkled projectiles. I'll get it working sooner or later.. There....... poke you stick at that !!! ...I have just got the mold from NOE, unfortunately I have not yet figured out the quirk of the mold, so all result are fully wrinkled projectiles. What is the mold make of mate...steel, brass or alloy? Wrinkly projectiles are usually an indication of a mold that is not hot enough, or the heat of the alloy is not high enough mate. I usually hang my mold on the edge of my melting pot as the mix is melting...that way it takes up heat from the melt process. Also, Between pours, I wouldn't leave it away from the heat for too long. Experiment with different temps of the alloy. When you projectiles come out with a frosty looking finish to them, then the alloy is too hot. We cast shot and find that the best temp is around 650 - 670 degrees F.
This is an Aluminum mold, 4 cavities..
Trust me Vince, I have tried heating up the mold from 650 to 850F in steps of 50F checked using digital thermometer, and casted a few every step. I cleaned and recleaned the mold, boiled them, brake cleaner, acetone etc etc again casted a few every step.. I tested the alloy (just in case it is contaminated) with my other molds they all thrown out perfect pellet.. I just have not yet figure this mold out.. I wont be using the boolit until December anyway. Anzac SSAA range is closed (politics ) so I havent got anyplace to shoot closeby. ok they are wrinkly but will they shoot ok anyway??? What's the composition of your lead? I think more tin (Sn) wouldn't hurt. Dont know mate, never shot it yet. I reckon I got at least 4% tin in the alloy and about 5% antimony, hardness after 14 days is about 15 BHN. I dont think more tin would make much difference..
and hard enough to penetrate a pig shoulder if casted with solid point. give them a whirl you never know till you try. This is an Aluminum mold, 4 cavities..I just have not yet figure this mold out.. I also had a problem a few years ago casting for 50 cal with a 4 cavity mold, tried upping the heat, even a separate heating element just to keep the mold hot. Then I took and drilled the spruce plate hole from 1/8" to 3/16" and problem disappeared. It seems that I could not get the lead in fast enough with the smaller hole. With a bigger hole it is a sweetheart now and cast perfect bullets. That is a baffling one Gelan. Have you got any of the alloy left that I gave you? That is the equivalent of Lyman #2 and casts beautifully...might be worth a try mate. I like the idea of almost pure tin Aloys. 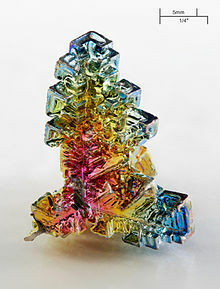 I think a much better option is Bismuth (Bi)...at 86% the density of Lead (Pb) it is fairly close in weight, although it costs a little more and does tend to be a little brittle in its natural form. It's best characteristic is that it has very low toxicity and is a recognised Lead substitute, often used for lead-free shot and fishing sinkers. It is also used in some pharmaceuticals. Current price of Tin (Sn) is USD$10.48 / lb, with Bismuth around USD$12.50 / lb. Lead is around USD$0.89 / lb. And.....for Stovey...it's purty too. (see below). That is purdy!!!! I want it! I thought that would get a few ultimate caliber votes for sure! Seenig as how it's been around forEVER. Stove, I do like the 7 mm Mauser very much. I have a very short, uggly Mauser 'stutzen' with a Timney trigger. With rather slow burning powder, a magnum primer and a 140 grs Nosler balistic tip, I can do almost anything I want with that rifle. I even got me a second one, a long chili Mauser because I don't want to ruin the uggly one on the range too much. and for black powder it's sure the .45 cal, especially with conicals in the Parker-Hale Volunteer or the Hawkin. For handguns? Sure the .22 LR, a little the 9 mm GP, a lot the 586 S&W in 38/357, even more the S&W 29 in .44 RM and of course the .45 ACP Colt Gold Cup Serie 70 with the conversion set to .22 LR. For black powder definitely the cal .44. Shotgun? Now that anything smaller than cal 24 is no longer allowed for hunting: the sweet cal 20, the rough cal 12 and the nice in between cal 16. The ultimate caliber doesn't excist. You better are still happy as long as you get the ultimate freedom to chose to adapt the caliber to your needs and wishes.